That quote may come off as little more than a general statement. But coming from coach Red Auerbach of the world champion Boston Celtics, it meant a great deal to me because it meant that I was going to be part of a new and exciting brand of basketball. It was 1965 and I had just signed as a free agent with the Celtics after struggling through my first couple of years in the league. 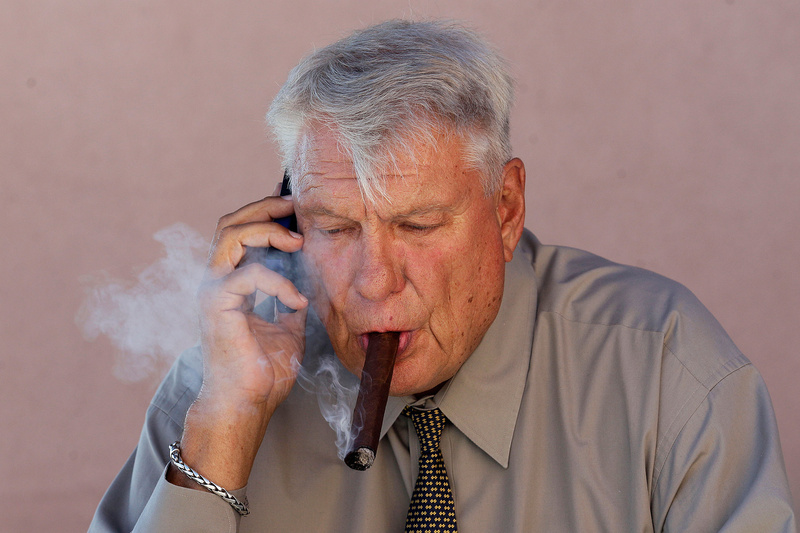 I was drafted in 1962 by the Chicago Packers, who later changed their name to the Chicago Zephyrs — and who also waived me after my rookie season. The Lakers claimed me shortly after and I played in L.A for two years, averaging a little more than six minutes a game in my final season. I was excited to sign as a free agent with the Celtics because I had always admired the way Red coached his teams. They were running and gunning and winning championships with a new style of basketball. The 1960s was known as the Decade of the Big Man. If you turned on an NBA game in the ’60s, it was almost certain you were going to see a center dominating a game — whether it was Walt Bellamy rising up for a slam or Wilt Chamberlain grabbing rebounds, big men were controlling the way the game of basketball was being played. He wanted to speed up the pace and dictate how the game was going to be played. And if there was anybody smart enough to do it, it was him. He was the game’s greatest architect, and the nine championships that he won as a coach were the result of some of the finest coaching in league history. As a newly acquired member of the Celtics I learned what Red meant by fast. We might have had the greatest center the game has ever seen in Bill Russell, but we were going to run anyway. If we could beat an opponent down the floor, we were going to do it. Just look back at old clips of us. 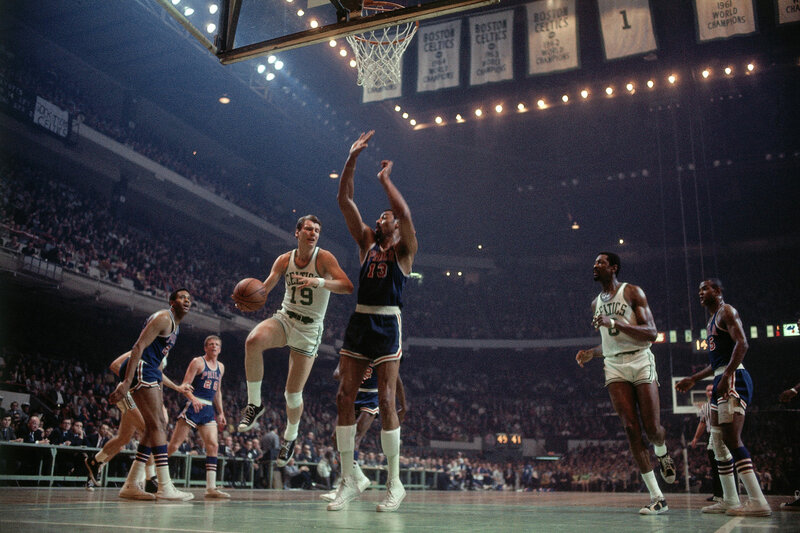 Bill Russell, even at 6′ 9″, was running the floor like a guard and scoring off easy touches. It was quite extraordinary. But this style of basketball didn’t happen overnight. We spent countless hours practicing with Red in the gym (aka, the School of Basketball). Red would spend a few minutes at the end of every practice drilling into our heads why the fast break was important and reiterating the mechanics that made it successful — the rebound, the outlet pass, the finish. It was all important. Russell was always part of the big team. It consisted of Wayne Embry, Satch Sanders, Bailey Howell and Toby Kimball. 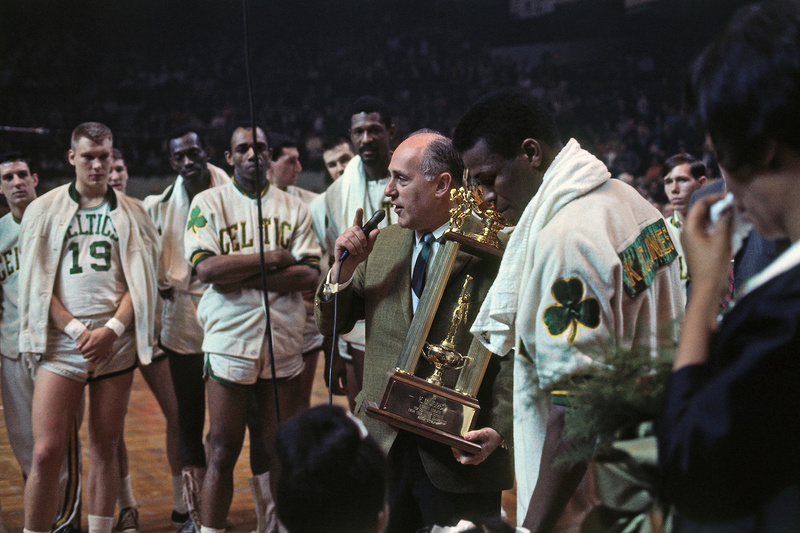 Havlicek’s team was the Smalls, and it would always be K.C. Jones, Sam Jones, Tom Sanders and myself. Bill’s team was supposed to beat us. Their strategy was actually quite simple: Pass the ball around and then dump it inside. On paper it wasn’t even supposed to be close, but we had something they didn’t have. From the moment Red would blow his whistle, we would just run Bill and his crew out of the gym. It didn’t matter that Bill had a bunch of giants on his team. Speed always wins. If we caught one of the Bigs on the perimeter, we would zip right past them to the basket for the easy points. Those scrimmages were teaching us that you didn’t have to be big to dominate the game. Smaller players can also take charge. The Smalls’ dominance on the practice court, premised on the importance of speed, was then something that the whole team would go out and replicate in games. Even the Bigs were in on the fun. After getting beaten to the basket by our guards so many times in practice, they were now the ones taking the ball to the hoop. And when we were playing in Boston Garden, games felt just like practices. If an opposing player missed a shot and Bill or Satch got the rebound, they would pass the ball up the floor to one of our guards, and it was off to the races. There was no hesitation. We were scoring within the first couple of passes. We were all on the same page. The league really hadn’t seen an offense like the one we were running, and the results were undeniable. For the 11 years I played with the Celtics, we won four championships and had only one season with more than 40 losses. Our offense was predicated on missed shots and forcing turnovers. If a team missed a shot or turned the ball over, we were going to try and beat them down the floor for the easy basket. Red’s style of play was something that always influenced me — even after my days of playing were over. My first coaching job wasn’t actually with the Celtics. 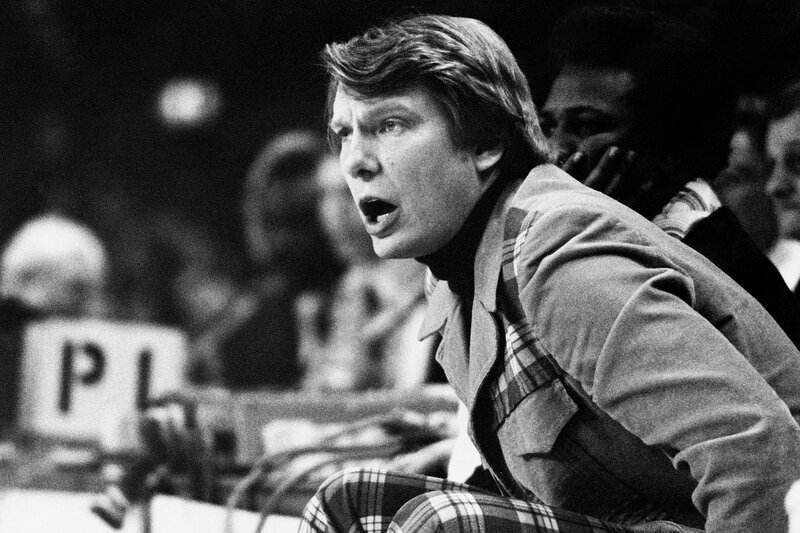 I began my coaching career over a thousand miles west of Boston, with the Milwaukee Bucks. I was an assistant in Milwaukee the first season after I retired, but then Larry Costello resigned midway through the 1977–78 season and I was thrown into the fire. I coached the team as though I was still playing for the Celtics, while implementing a few of my own strategies. I knew I wanted to play unconventional basketball and use speed to my advantage. But it wasn’t going to be as simple as using a couple of pages out of Red’s playbook. In the beginning, we were not the most talented bunch. The Bucks didn’t have any Bill Russells or John Havliceks, but they competed every night and that meant more to me than the W’s in the win column. It wasn’t until we got Bob Lanier and Paul Pressey that I realized that we might be on to something. Lanier was as skilled as any big man in the league at the time, but he was also a bit of an older player when I got him. I had to tinker with our style of play so that it would fit his strengths. He was a rebounding machine and made things much easier on the boards for the team. But it was the addition of Paul Pressey that brought a different dynamic that I had never seen before. Pressey was 6′ 5″, with long arms and ballhandling skills as good as some of the best guards in the league. He was naturally a forward, but with his great hands I had no problem playing him at guard. It was like having a point guard in a forward’s body. He was just a matchup problem for defenders. Not to mention, he made the team better. For several seasons he averaged more than seven assists a game. There weren’t that many forwards who could score, defend and pass like Paul Pressey. He was a phenomenal player. As the years went by and we started wheeling in new pieces to add to the team, we started to show glimpses of my vision: unconventional basketball with an emphasis on the fast break. That was my signature style of play. 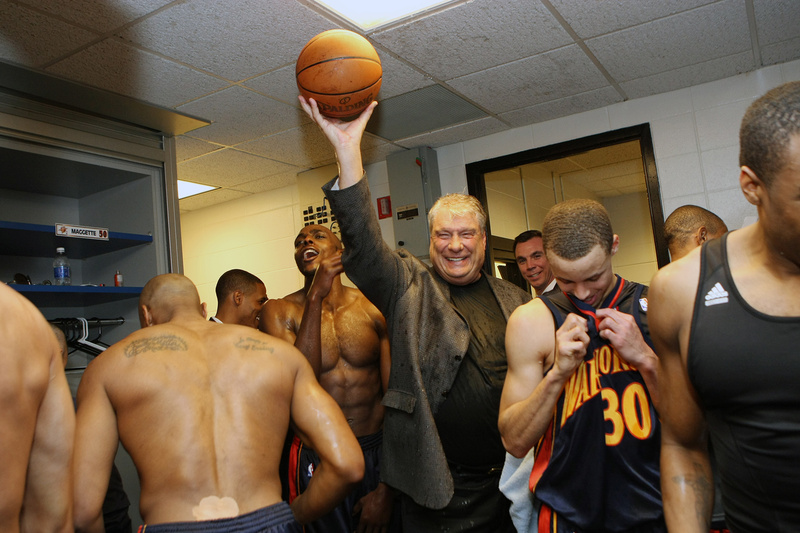 I left Milwaukee after 11 seasons to become the head coach of the Golden State Warriors, but I didn’t stop tinkering. And in 1989–90, my second season in Golden State, my style of play (later known as Nellie Ball) began to really take shape. I wanted to coach a team that could run a fast break led by a forward. But most of all I wanted to have all my best players on the court at the same time — regardless of position. With the Warriors, I had three All-Star caliber players in Tim Hardaway, Chris Mullin and Mitch Richmond, so obviously I wanted them all on the court at the same time. I understood that I was going with a smaller lineup, so it was clear that we would have to emphasize speed. I wanted us to run in Golden State the same way we ran in Boston and the same way I coached in Milwaukee. I wanted to push the ball. 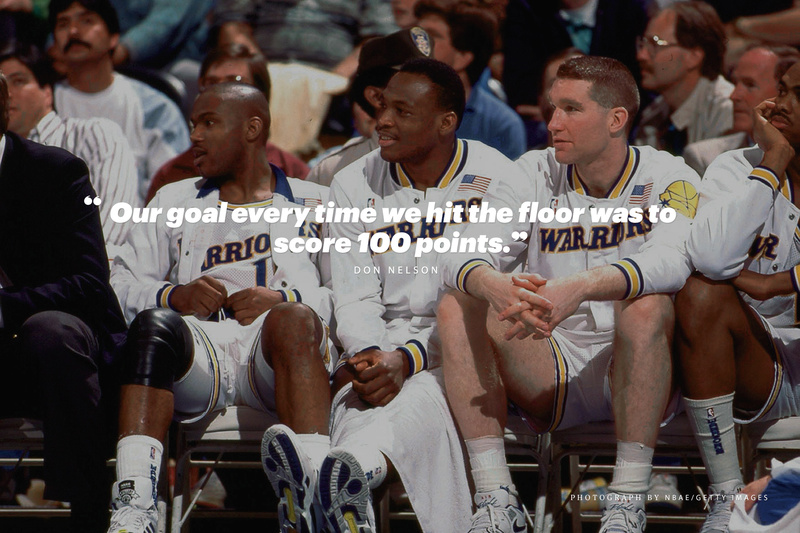 Before long, we were leading the league in scoring and the term Run-TMC was born. Our goal every time we hit the floor was to score 100 points, and on lots of nights we scored more than that. Timmy would push with Chris or Mitch on the wing and the defense would just be at our mercy. But when you play small, teams are going to do everything they can to beat you inside. So I adjusted my personnel. I wasn’t going to try and battle with the big men. I would outsmart them. So I had my forwards handle the ball — just like Paul Pressey used to do during my Milwaukee days. And although Chris Mullin and Mitch Richmond were skilled forwards who could handle the ball, there was another forward on that team who doesn’t get enough recognition for his abilities. His name is Tom Tolbert. He wasn’t exactly the equal of the guys in the Run-TMC crew, but he was great. At 6′ 8″, he was actually one of my most talented big guys. He caused mismatches for opposing centers because he could face you up while being crafty enough to do damage from the perimeter. All my success as a coach is shared with my many assistant coaches, training staff members and players. But without Red Auerbach teaching me the mechanics of running the fast break, none of it would have been possible. He deserves all the credit for Nellie Ball, and for how fast the game of basketball is played today. In the NBA today, you see that smaller players are more dominant. With the hand-check rule in place, guards are able to play more freely and shoot threes, which opens up the floor. They are also able to use their speed to their advantage and make the game easier for others. This style wouldn’t be possible if Red hadn’t come up with it in the first place. The one team that does all these things best, and that I enjoy watching most, is the Golden State Warriors. Coach Kerr is doing an impressive job with that team — especially with Steph Curry. The way Kerr utilizes Steph’s ability on the court reminds me of how I used to use Steve Nash in Dallas. The way Nash was able to read screens and make shots when players weren’t guarding him close is very similar to way Steph plays. It’s obvious Coach Kerr and Steph Curry have been doing their homework. There is nothing wrong with copying what works. It’s not against the rules to watch film and try to replicate what’s working. When you look at all the teams and players that have been successful, in some sort of fashion they were inspired by the great teams and players that came before them. The wheel rarely reinvents itself. We are all inspired by someone.